We offer gentle, safe, natural, chiropractic care centered on the individual needs of each patient. 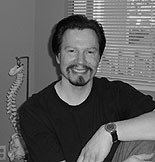 Dr. Tom focuses on pain relief, corrective and preventive care with emphasis on soft tissue techniques. He has incredible knowledge and sense of humor that makes complex information easier to understand. You are able to walk away feeling better with a deeper understanding of your physical well-being. ▶ Thomas M Mosca, D.C.